I have highlighted extreme levels of equity bearishness in the past, in the form of AAII sentiment and the NAAIM Exposure Index, so I won’t repeat myself. 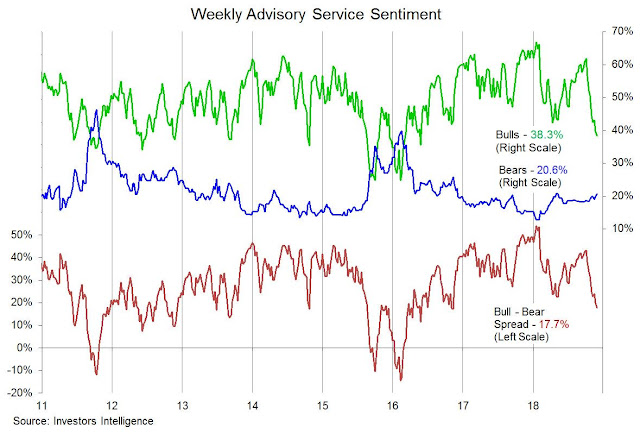 Another data point of a crowded short appeared this week in the form of II sentiment. The bull-bear spread has fallen to levels not seen for two years. Helene Meisler also very succinctly summarized the bull case last weekend in a Real Money article. The article is well worth reading in its entirety, but here are her key points. The chart patterns between the current episode of weakness looks very similar to the one experienced in 2015-16. 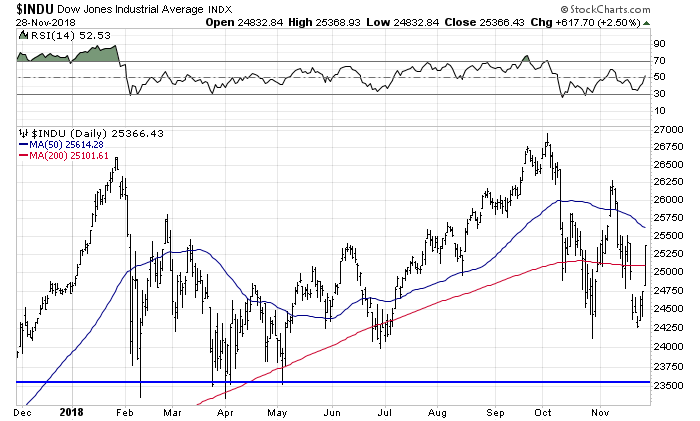 It is therefore natural to think that the market will rally and come back down to re-test the previous lows. She went on to demonstrate that the FAANG market leaders are performing better today than the 2016 episode. In addition, we are seeing a high low on the NYSE Advance-Decline Line compared to 2016. Never say never, but the odds are stacked against a re-test of the old lows. Here is the bear case. It’s all up to the US Dollar. 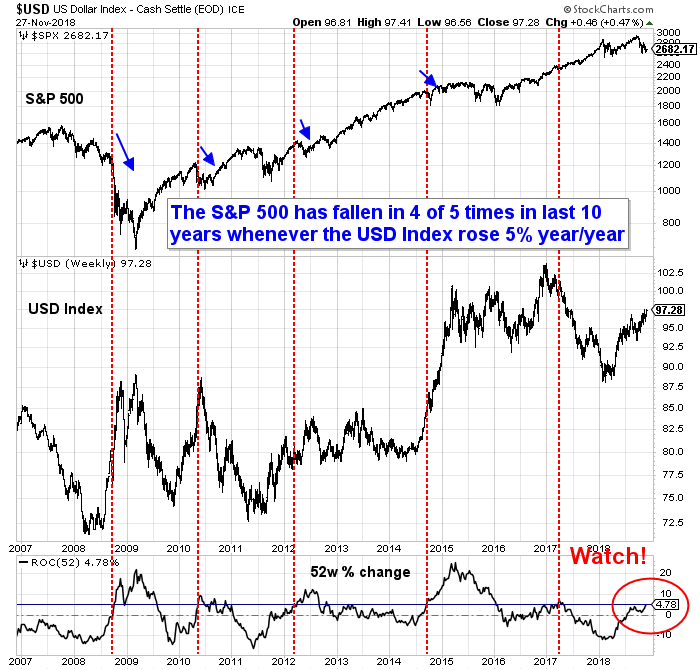 I have shown this chart before, but the stock market has historically come under stress whenever the annual change in the USD Index exceeds 5%. Any sign of strength up to about the 76.50 level would trigger that sell signal. The USD Index closed Wednesday at 96.83. There is considerable upward pressure on the USD from economic growth differentials. 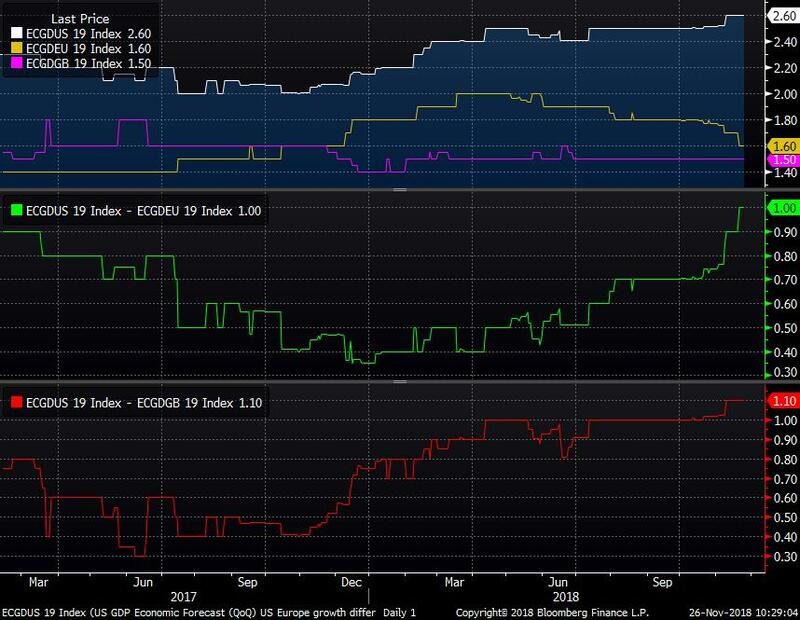 According to Bloomberg’s consensus survey, the US ix expected to outgrow the eurozone and the UK by 1% next year, which is the widest divergence for 2019. The Fed is data dependent. 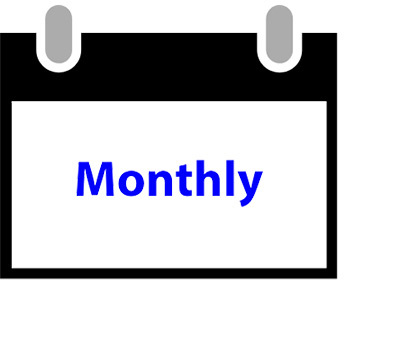 Growth will almost certainly slow in 2019. If it looks like to slow sufficiently to halt the slide in the unemployment rate while inflation remains low, the Fed will slow the pace of rate hikes. If unemployment continues to slide while inflation remains low, then the gradual pace of rates will continue longer. If unemployment slides and inflation ticks up, the Fed will probably hike a little faster. Discount the Fedspeak, watch if the evolution of the dot plot matches the “dovish” rhetoric. This weekend will see the Trump-Xi meeting. Anything could happen. Further dollar strength at this point could create havoc for stock prices. Subscribers received an email alert that I had sold my long positions into the rally ahead of the Trump-Xi meeting this weekend. It’s time to step aside ahead of this binary risk. I bought some cheap options…if the bears are out there in force, they have to be nervous about this weekend. Trump likes the show, so I think anything is possible. Which makes me wonder about a squeeze for the next 2 days. If this happens I will cash out by Friday. The combination of dovish comments, weekend meeting and lots of shorts out there. I’m trying to think of a comparable setup but I can’t. Trump has said repeatedly that he will stay the course on tariffs and the market has sold off each time until yesterday, when the market just shrugged. Maybe there are just so many times that bad news can be discounted before it’s baked into the cake. I expect a big rally on any agreement, otherwise a tepid response. Excellent points Robert. I am in agreement with your thoughts. Agree with you Robert. President Xi and DJT will have a nice dinner of Argentinian beef and wine today. There will be a feel good announcment like “Frankly I do not want to put further tariffs and President Xi wants to make a deal”. The stock market rallies another 500 points on the Dow and to 2800 on S&P. What happens thereafter is the key. China does not deliver would be a good premise. US deficit with China goes higher next year. Cam, has outlined the rest, that this market rally lays down a bear trap, as global economies have slowed down. US housing (15% of GDP) has already taken it on the chin (https://tradingeconomics.com/united-states/nahb-housing-market-index). 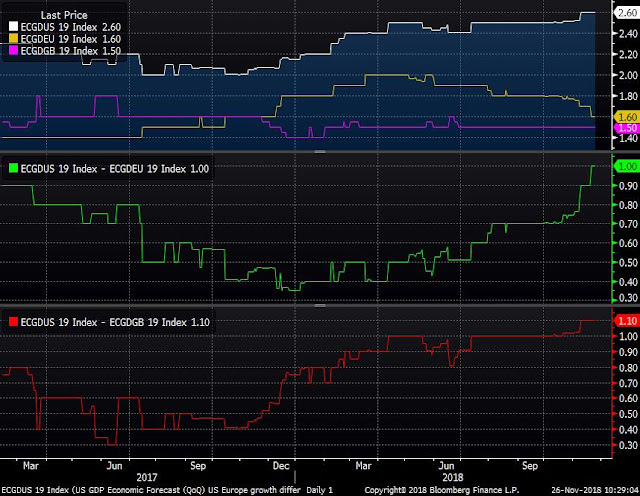 US fed will ramp up QT but keep Fed funds rates close to where they are (see secretary Mnuchin’s recent comments; he asked bond market investors if they prefer rising Fed rates or QT). 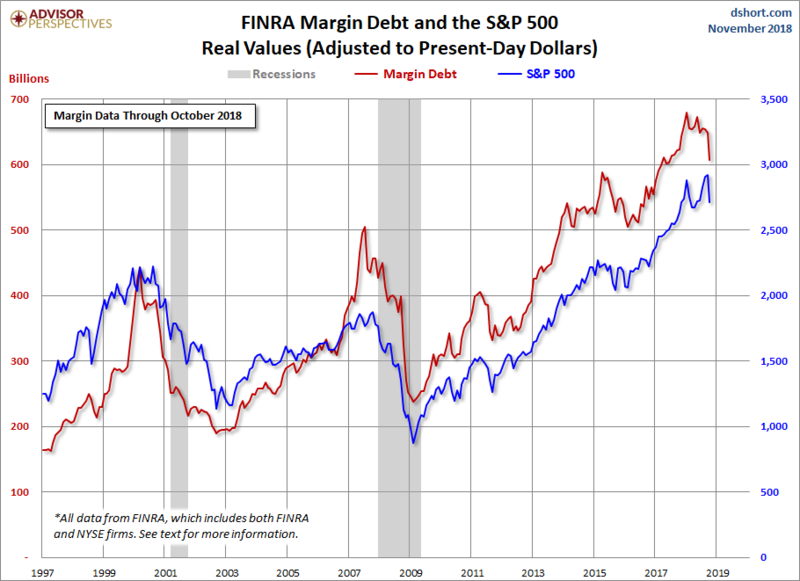 Recent margin balance is showing a sharp downturn (https://www.advisorperspectives.com/images/content_image/data/71/716083fd9f0ad0d376599672e9a6390a.png). The deal with China about two decades ago with America was simple. America needed access to Chinese markets, and China needed technology. China delivered, as promised. China kept its part of the bargain, and see nothing wrong about America keeping its end of the bargain. They see as a contract that needs to be enforced. Now China wants to compete with the US on High tech. Do we think China will simply deliver that easily this time? America has a problem with high labor costs, poor education (see venerable analysts comments Liz Ann Saunders recent tweet https://twitter.com/LizAnnSonders/status/1067063790603288576) and very high and rising health care costs. These are, structural problems for which America blames China. Let us get real in life. If we as Americans think that China will buy our products, forget it. China needs technology. America does not have a monopoly on technology, for heavens sake, there are many European and Asian economies that can and will compete with America on technological prowess. 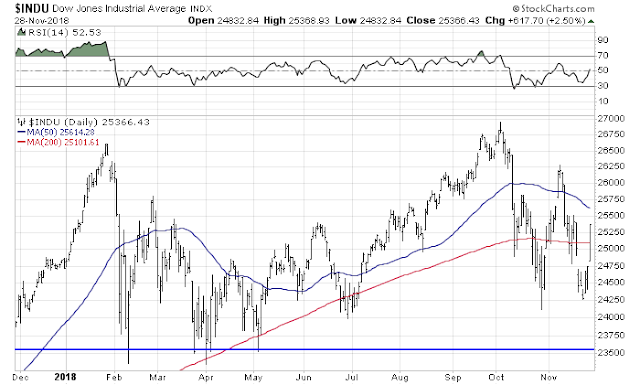 We may have a tradeable rally here, but could also have a sharp pull back in the market here. 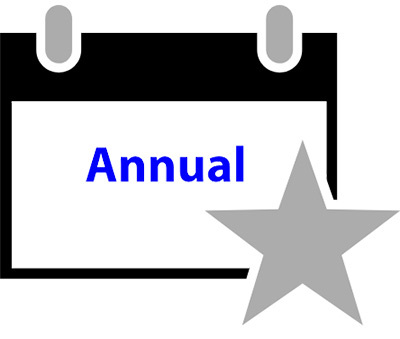 I would like to remind readers that the 2007 bear market started circa 15th December. Yield curve from 2-5 years is only 0.03%(https://twitter.com/EconguyRosie/status/1068482009750794240). Ten year treasury rallied last week, and rallied hard late yesterday, as money flowed into ten year treasury, January futures; The 10-2 year spread narrowed further to 0.21%(https://twitter.com/charliebilello/status/1068683896592760832). We are close to zero from 2-10, not far from inversion. If readers of this platform sell out within 10% of a major market peak and buy within 10% of a bear bottom, we would all do well. Cam, Ken and Gluskin Sheff’s chief Economist David Rosenberg (with apologies, Cam) have been warning of a train wreck, all year long. Excellent. Looking for $280 in SPY, if we break above, we are going up for some time.